As I’ve mentioned before, the idea for this column came from an annual movie clip party that a friend of mine and I have been throwing for the past 16 years, to which guests bring favorite short scenes. (In the old days, people showed up with VHS tapes cued to the scene in question. Nowadays, clips are sent weeks or even months in advance and get pre-edited into our own version of That’s Entertainment!) There’s been a lot of discussion over the years about just what constitutes a good clip. Finding a winner is trickier than you might think, as it can be hard to predict whether a hilarious gag or intensely powerful moment will still work when presented out of context. I only just last year brought the final scene from Claire Denis’ Beau Travail, for example, after fretting for over a decade that it would be completely meaningless without the entire movie preceding it. (It went over okay.) If most people already know the movie, that helps; even then, though, classic bits can fall flat. What the hell, let’s actually break this down. No question about where the act break occurs: It’s when Bill casually tosses the pistol onto his desk, in easy reach of Beauchamp, and tells him to pick it up. What follows is a beautifully played little stand-off, familiar from many other movies, in which one character hands another a gun, which may or may not be loaded, and invites him to pull the trigger. This never seems like a good idea, and Beauchamp doesn’t really consider it very seriously, looking petrified the entire time; Rubinek barely even lets the poor guy make eye contact with Little Bill, and his right hand, holding the gun, keeps drooping downward, as if the sheer gravity of the situation is acting upon it. It’s at this point, however, that Eastwood brings English Bob into the scene, watching him struggle upright in disbelief at the unexpected opportunity for escape. Ordinarily, a scene like this would cut back and forth between the two men involved in the potential shooting, but Beauchamp keeps shooting glances at Bob, who gets more prominent in the frame every time Eastwood cuts back to him. Even without knowing what’s going to happen next, one can intuit that Beauchamp is really a proxy figure in this confrontation. Certainly, Beauchamp is well aware of it. Just as the tension gets defused, with Little Bill once again dropping his stone-cold killer routine and breaking into an amused grin, a more serious threat appears. Rather than return the pistol, Beauchamp pulls it away from Bill’s outstretched hand and asks, nervously, what would happen if he gave it to English Bob instead. This clearly isn’t a rhetorical question—if it were, there’d be no need for the sudden movement backward, toward Bob’s cell—and the terrible stillness with which Bill replies, “Give it to him,” makes a mockery of his previous tough-guy poses. Harris, for his part, plays this entire scene without uttering a single word, using only his eyes to signal Bob’s efforts at determining whether this is a gift or a death sentence. His inner calculation is so fearsome, and Hackman’s corresponding stare so intense, that I don’t think I’d ever previously noticed the silent comedy routine taking place between them, as Beauchamp attempts to make the pistol available to Bill without risking being mowed down in the crossfire should they actually start shooting. Judiciously placed rumbles of thunder on the soundtrack contribute to the harrowing mood without ever crossing the line into cheesiness. Ultimately, English Bob decides it’s just too likely that the pistol isn’t loaded, and that Bill is just looking for an excuse to execute him right there in the jail cell. In an eloquent touch, the camera tilts upward to follow Bob’s hand as he takes hold of one of the bars instead, by way of declining the offer. Peoples has the confidence to let the aftermath play out wordlessly: Knowing what Bob had assumed, Bill proceeds to empty the pistol’s chambers in front of him, and Harris conveys his agony at having guessed wrong with a barely audible sigh and a mild slump. The bullets falling to the floor at Bill’s feet are the scene’s punchline, but its button is the sober line he delivers to Bill, framed by Eastwood as a low-angle close-up from within Bob’s cell: “You were right not to take it, Bob. 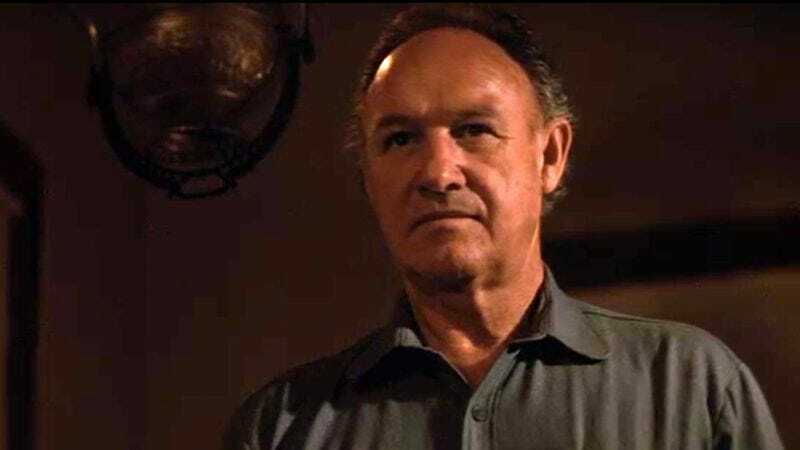 I would have killed you.” Hackman speaks these words not as a final taunt but as a simple statement of fact, bringing this mini-narrative to a close: Disaster was successfully averted, even if it was for the wrong reason. Order, briefly threatened, has been restored. It doesn’t get more satisfying than that, in only a handful of minutes.